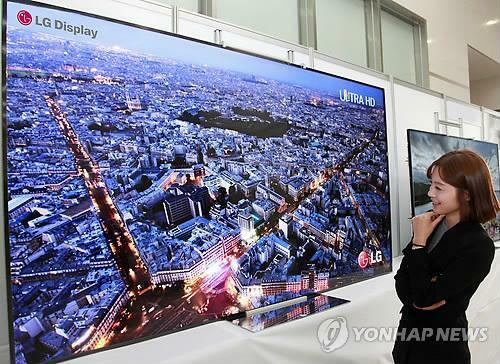 [THE INVESTOR] LG Display has started executing its 1 trillion won ($850 million) investment into Korean plants to beef up production of organic light-emitting diode panels for TVs and smartphones. The display-making unit of LG Group is also ordering new equipment from local suppliers, the Electronic Times reported on June 17. According to the report, the company is replacing the production line for liquid-crystal displays at its P8 plant in Paju, Gyeonggi Province, with those for larger OLED panels for TVs. With the planned production of an additional 25,000 panels per month, LG’s OLED production capacity for TVs is expected to surge to some 60,000 units per month this year, almost double last year. An LG Display spokesperson denied any drastic reduction in the company’s current LCD production which is facing increasing challenges from Chinese rivals. “LCD production will be transferred to our Chinese plant in Guangzhou. There will be no drastic change in our total production volume,” he said. The report said the company recently started investment worth 310 billion won into flexible OLEDs, under its total 1.05 trillion won investment plan announced last year. The production capacity of its E5 plant is expected to surge to some 7,500 units per month. The company is also considering injecting another 150 billion won into OLED lighting. “We have invested some 3 to 4 trillion won every year. We will continue new investments to beef up OLED production,” an LG display spokesperson told The Investor.